A retired teacher from Brooklyn, William Nelson Sr. (right) is in critical condition after Thursday's car crash in Times Square, left. 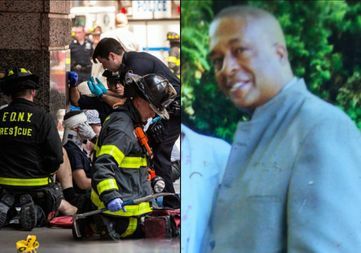 GREENWOOD HEIGHTS — Doctors are “cautiously optimistic” about the recovery of William Nelson Sr., a retired teacher who was among 21 people mowed down in Wednesday’s Times Square car crash, his son said at their Brooklyn home Friday. The 64-year-old is sedated, using a breathing tube and suffering from bleeding in the brain after the crash, according to his son William Nelson Jr., 35. He also has a broken leg. "The bone was protruding,” he said Friday afternoon as he left home to visit his father at Bellevue Hospital. His dad had been trying to get tickets for the Broadway play “Six Degrees of Separation” when he was hit, he said — a fact his son learned only after the emergency. "I didn't even know he was in Times Square," he said. Despite Nelson Sr.’s critical injuries, his caretakers at the hospital are feeling hopeful about his recovery, his son said. "The doctors are cautiously optimistic," Nelson Jr. said. Nelson Sr. was among the 21 people hurt when Richard Rojas, 26, pulled a U-turn at West 42nd Street, jumped a curb and plowed up a sidewalk full of pedestrian for several blocks, police said. Rojas killed Alyssa Elsman, an 18-year-old tourist from Michigan, and left her 13-year-old sister Ava with a collapsed lung and broken pelvis, when he plowed his Honda Accord into them, NYPD Chief of Manhattan Detectives William Aubry said at a press conference at the scene Friday. "Out heart goes out Alyssa, her family, all those that were injured yesterday for what they encountered," Aubry said. Rojas has been arrested and charged with murder, 20 counts of attempted murder and aggravated vehicular homicide, NYPD officials said. Investigators will search Rojas' car and Bronx apartment soon, and are awaiting toxicology results to confirm that Rojas had PCP in his system as he told arresting officers, Aubry said. Besides Nelson Sr., two other victims remain in critical condition, including a 38-year-old Canadian woman.